Thomas Cooke, the head supervisor at the lumber mill in Coloma, California, watches his friends and coworkers return home every day to their loving wives and begins to desperately long for a wife of his own. There aren’t many women living in town who aren’t already spoken for, however, so he decides to place an advertisement for a mail order bride. He anxiously awaits the results of his efforts, and before long, he has the pleasure of penning letters to a charming cook named Ms. Violet Pringle. When she arrives, it seems as though they were made for each other, cut from the same piece of dough, as Violet likes to think. Just days after their lovely wedding, while Thomas is away at the mill, a fire breaks out in town. To his dismay, he quickly learns that the flames are in fact coming from his home. Will Violet, the love of his life, be spared? Will the flames devour the home he built with his very hands? 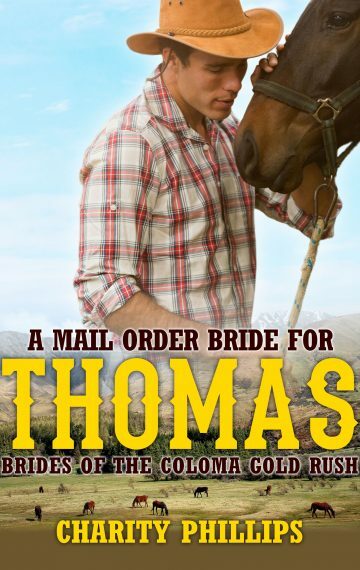 ***This is the fourth book of the Brides Of The Coloma Gold Rush series. Each book within the series is a STANDALONE clean mail order bride romance story and may be read without having read the other stories first.